The machine is suitable for aseptic packaging of UHT-sterilized liquid milk and various self-flowing liquid foods such as non-gas beverage, juice, coffee, vegetable protein beverage, tea beverage, fruit wine, etc. The whole machine adopts all stainless steel materials and core components. All of them are world-class brands, which automatically complete paper feeding, sterilization, filling and molding. The packaging form is paper-aluminum composite brick. A filling equipment using paper aluminum composite aseptic packaging material as a packaging material, adopting fully automatic control and electromechanical integration operation technology, through the sterilization of packaging materials, sealing and filling in a closed aseptic environment at one time Packing and molding to achieve aseptic packaging of liquid foods, the packaged foods do not need to be refrigerated, and can be stored at room temperature. It is used for filling liquid foods such as beverages and dairy products. Pre-forming adopts the invention patent-rectangular preforming method, which replaces the round forming method and device of Tetra Pak, which makes the machine run more stable, the performance is more reliable, and the product appearance is more perfect. 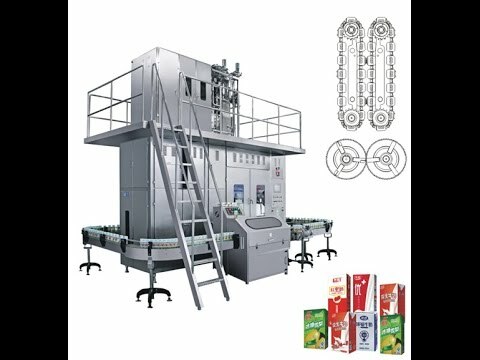 Paper feeding adopts rolling type, quantitative, sealing and cutting system, and the multi-layer mop type mechanism of mechanical transmission replaces the robotic grasping mechanism of Tetra Pak to make the machine run more smoothly. Fully automatic operation of smooth delivery of paper rolls, printing date batch number, pre-sticking strips, chemical sterilization and physical sterilization, pre-forming, filling, horizontal sealing, shaping, cutting, and sticking. Incorporate the latest technology of modern opto-mechatronics, integrated design, and precision manufacturing. Closed-loop control technology is used to control tension, photoelectric detection, PLC calculation control, touch human-machine interface operation, monitoring, radiant heat, and high-frequency induction power supply, making the strip and longitudinal and horizontal sealing more firm and reliable. The main drive is mechanical, the auxiliary drive is pneumatic, scientific and reasonable use, making the machine run more freely and stable. Specially equipped with a non-stop rewinding device, the machine can easily change the roll and dock the paper without stopping the machine.